Radioactive! 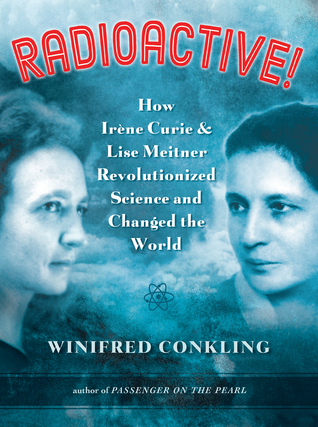 : How Irène Curie and Lise Meitner Revolutionized Science and Changed the World by Winifred Conkling. Grades 7 and up. Algonquin Young Readers, January 2016. 240 pages. Reviewed from ARC provided by publisher. Irene Curie. Lise Meitner. These are two names that I'd guess you're not too familiar with. And yet, without the discoveries made by these remarkable women, our world would be a much different place. Curie, daughter of the Nobel-prize-winning Marie Curie, discovered artificial radiation - that nonradioactive materials can pick up radioactivity when exposed to radioactive materials. Meitner unraveled the clues that led to the discovery of fission - that the atom could be split and generate a TON of energy. Both these discoveries - artificial radiation and fission - led to the creation of nuclear power and the atomic bomb. It wasn't easy to be a woman in the male-dominated world of science in the 1920s and 1930s, but that's not really what this book is about. It's about these two strong, smart women and their incredible determination to solve some of the world's mysteries. Curie poisoned herself with radioactive elements to make her discoveries. Meitner fled from the Nazis and started a new life to continue the work she was doing. If you like the science adventure in Bomb by Steven Sheinkin, don't miss Radioactive! which is kind of like a prequel. My thoughts: I loved this book. It's part biography, part science book, part adventure story, and all fascinating. It illuminates the work that these two women did, which not very many people know about (which is one of my favorite kind of books to read). Conkling also does a great job of explaining the science without going over the head of readers. I vaguely remember a few solitary facts from high school chemistry and physics classes, but I never felt lost as I was reading. She heightens the drama of these important discoveries and makes it easy to see why they were so significant. I found this book fascinating and would happily push it into the hands of budding scientists, especially (but certainly not limited to!) young female scientists. Readalikes: Of course, Bomb by Steve Sheinkin, which kind of takes up where this book leaves off and explores the development of the atomic bomb. Readers interested in more narrative nonfiction about science and discovery might enjoy Charles and Emma: The Darwins' Leap of Faith by Deborah Heiligmen, which is another great blend of biography and science. Readers looking to explore important females in history might also be interested in Borrowed Names: Poems about Laura Ingalls Wilder, Madam CJ Walker, Marie Curie, and Their Daughters by Jeannine Atkins. This biography-in-verse explores these famous women and their relationships with their daughters.